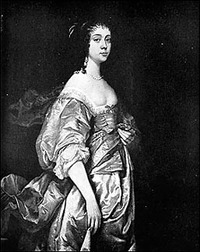 Margaret Lucas Cavendish, Duchess of Newcastle, was the youngest child of a wealthy Essex family. At the age of 20 she became Maid of Honour to Queen Henrietta Maria and traveled with her into Persian exile in 1644. There she married William Cavendish, Marquis (later Duke) of Newcastle. Between 1653 and 1668 she published many books on a wide variety of subjects, including many stories that are now regarded as some of the earliest examples of science fiction.